In Stargate’s Legacy, Adam Barnard looks back at some of the Stargate franchise’s finest episodes. Read more here! 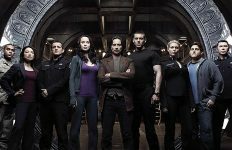 As a self-professed Stargate Universe fanatic, picking just three episodes for my Legacy column seemed like an impossible task. After struggling to narrow the field to a “mere” dozen short-listed episodes, I decided to change the rubric. Stargate Universe was never trying to be Atlantis or SG-1, and as such, it should be judged by its own artistic merits. If Universe had tried to emulate episodes like “Window of Opportunity” or “Midway” — it would risk feeling disingenuous or derivative. The story of SGU was an inherently dire premise, and the characters’ attitudes and actions needed to reflect that. MSgt. Greer discovers Spencer’s corpse. After the increasingly unstable Sgt. Spencer (Josh Blacker) fails to show up for KP duty, MSgt. Ronald Greer investigates — only to find a deceased Spencer sprawled across his own bed. The bullet wound indicates suicide, but the weapon itself is absent — leaving Colonel Everett Young and Camille Wray to deduce that Spencer was murdered. Search parties are organized to inspect crew quarters, but the plot thickens when the handgun in question is discovered in Young’s bedroom. Camille Wray responds by launching a court-based inquiry — randomly selecting Destiny personnel as the jury. Wray is hungry for blood (perhaps at the cost of due process) as she is chomping at the bit for Young’s command post. Young senses this, and enlists Chloe Armstrong as his defense attorney. The legal battle is hard fought, but the tide ultimately shifts in Wray’s favor. To avoid a judicial catastrophe, Young strikes a deal with Wray: charges will be dropped due to insufficient evidence, but he must resign as commander — leaving Wray as his successor. They shake on it, and the change goes into effect. Camille Wray conducting the investigation. Later Destiny drops out of F.T.L., and an off-world reconnaissance team stumbles upon an abandoned alien craft. Colonel Young and Dr. Nicholas Rush investigate — but they’re up against the clock. Minutes before Destiny jumps back into F.T.L., Young confronts Rush and accuses him of planting the handgun in his room. Rush shamelessly embraces the accusation and monologues on how the Colonel is ill-prepared to lead the crew of the Destiny. By chance Rush had stumbled upon Spencer’s corpse, and saw a chance to frame Young. But Young (much like myself) is having none of it. He assaults Rush and leaves him for dead — making it back to Destiny with just seconds to spare. During a debrief in the infirmary, Young recounts the “rock slide” that led to Rush’s demise — but many aboard the ship have their doubts. “Justice” is a brilliant example of the hour-long thriller format done right. It delivers a grounded story that builds from previous exposition and dynamics, but it also forges its own identity and standalone narrative — one that leaves viewers entertained yet sickened. Almost Hitchcockian in its approach, the silence and tension deliver far more thrills than the climactic “action” scenes — and the episode knows this. Rather than play out like a sub-par network procedural, “Justice” depicts an ever-evolving equilibrium of power dynamics and character motives. One with profound consequences, at that. The story is engaging. The pacing is perfect. And by the time Eli began to uncover Rush’s conspiracy (and the missing kino footage) my foot was tapping uncontrollably. My forehead perspiring. And when you’re watching it live — free of any spoilers or fandom retrospect — it’s far more thrilling. The story of the Destiny crew is literally unfolding before the entire world, and I was one of the first to witness it. We’ve gotten used to the Destiny having a lifeline to Earth in the form of the Ancient communication stones (perhaps a little too comfortable, at times). But that safety net is violently yanked out from underneath the crew in “Justice,” and the full weight of their isolation sets in. Chloe Armstrong and Camille Wray cross examine a witness while Young lurks in the background. So, the crew is ultimately faced with an urgent yet politically-delicate matter that must be handled entirely in-house — almost like a tribunal from those old westerns. No time to call a sheriff; the “town” itself must take action. And it’s a wonderful time to be a fly on the wall. We learn so much about our “heroes” and how they react under the pressure-cooker. You’re only as good as your weakest link (or your poorest decision), and in “Justice” several characters are put to the ultimate test. “We’re trying to get to the truth, here!” Camille Wray yells, as things heat up between her and Chloe Armstrong outside the courtroom. “I don’t think that’s even possible,” Chloe retorts. “We can’t afford to have an unsolved murder hanging over our heads,” Wray argues. Ten episodes into Stargate Universe and it becomes clear that we’re not focused on “right” and “wrong” in this show. We’re focused on survival, desperation, personal agendas, and hubris. The Destiny awaits Young and Rush’s return. Stargate Command was a selection of highly qualified individuals who ran, quite possibly, the most important covert operation on the planet — with the SG-1 team being the ultimate manifestation of that excellence. 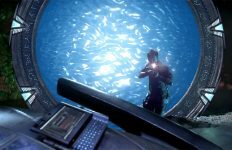 Similarly in Atlantis, the “best and the brightest” (as Weir put it in “Rising”) were selected to undergo a dangerous intergalactic mission that could very likely be a one-way trip. Destiny, however, is populated by a group of evacuees whose lives were irrevocably altered when Dr. Nicholas Rush dialed the ninth chevron during the eleventh-hour evacuation of Icarus Base. They’re hardly qualified to be off-world, much less crew a mission of this caliber. I put “heroes” in quotes for a reason. The trend of anti-heroes started to rise to prominence in the late 2000s with TV shows like Mad Men (Don Draper) and Breaking Bad (Walter White) — putting violently flawed characters in the position traditionally occupied by a more respectable and charismatic protagonist (see: Jack O’Neill). 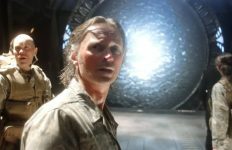 Stargate Universe wasn’t the first to the anti-hero party, but it was still ahead of the curve — and it brought a unique take to the table. By “Justice” we’re still trying to figure out who our hero (or anti-hero) on this show is. But, truth be told, there isn’t one single standout. SGU seems to have an entire ensemble of anti-heroes — flawed but relatable individuals who vary in their behaviors and their virtues from week to week. And that’s what life is like. I’d be hard pressed to find a single role model in my own community who hasn’t stumbled tragically at some point. 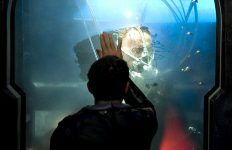 People are inherently flawed, and one of SGU‘s strengths was showcasing realistic, multi-dimensional characters — military, civilian, or even alien — who had complex motives and urges. In the case of “Justice” we saw the darkest corners of Rush’s soul, the toxic bureaucracy of Camille Wray, and Colonel Young’s descent toward homicide. While I know where my loyalties would lie in this scenario, it becomes clear in the episode that audiences aren’t asked to pick “Team Young” or “Team Rush” or “Team Wray.” They are only asked to watch with an open mind, and make their own determinations. On top of the already compelling central premise “Justice” boasts plenty of sub-plots that move the story forward and complicate ship-based dynamics. An alien craft is discovered, later understood to have belonged to the Nakai. Rush manipulates Dr. Franklin to sit in the Ancient chair, putting him into an indefinite coma (arguably the catalyst for the Rush-Young blowout). And the first signs of a complex alien civilization is discovered by the crew — the beginnings of a formidable adversary that will stop at nothing to take Destiny. In the end, “Justice” is a shockingly dense but immaculately paced hour of television that — like a fine wine — only gets better with age. Sometimes I think Stargate Universe‘s biggest flaw is the fact that it has “Stargate” in its title. After re-watching the show several times over the past few years, I’m convinced that it is a marginalized and under-appreciated entry in the impressive lexicon of modern television. That said, I don’t fault Stargate fans (or even casual viewers) for failing to spark with the series. Art is subjective. We’re just looking for individuals, scenarios, and themes to connect with — recognizable components that we can identify as truth and reality. And for me, Universe represents that kind of profound truth on so many levels. At first, I was like a lot of other Stargate fans: I wondered why “Air Part, 3” had no running and gunning. Why “Time” didn’t have a definite conclusion. Why “Life” was so heavy on the personal drama. But by the time “Justice” rolled around, I got it. I understood what the writers were going for — and that I needed to trust the storytellers to take me on a fresh and unexpected journey. Stargate Universe certainly wasn’t the Stargate I knew — but it was the Stargate I wanted to discover more of. And after “Justice,” I was able to fully commit to the story and style of SGU. 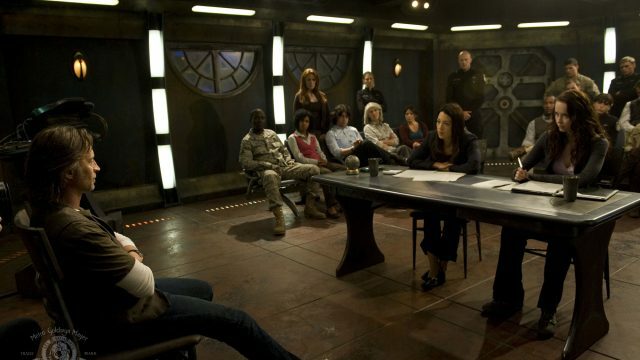 “Justice” was written by Alan McCullough and directed by William Waring, and premiered on Syfy Channel December 4, 2009.